This photo was taken during summer 2017, as I chased the impending hail storm. The lesson was shutter speed. All of my technology crashed over the summer. My 2011 iMac crashed at the beginning of July; then my iPad, then my iPhone... Will write more about that experience later. Snow days are an excellent opportunity to recalibrate and center oneself. Gratitude. Red Bank Green gave the Annual National Juried Art Exhibition a wonderful write-up. Happy to have my work featured in the Monmouth Museum exhibition. I'm in a thrilling place with my running practice. Taking my run off-road onto the field, backwoods and expansive open fields that are all around me has set my spirit free! The run is harder, yet my body does not feel the brunt of the impact. I feel myself getting stronger. I've been researching the benefits of grass running. I will continue to train this way for the half marathon I have coming up in December. After both the anagama and noborigama were completely unloaded. Tony engaged everyone in a discussion of the kiln results. Tony described the particulars of the firing process, as well as the unique challenges that contributed to what was most unique about the April firing. Tony encouraged everyone to share special glazing and surface results. It was my first time participating in an unloading from beginning to end. I found it to be incredibly educational. I was excited to see so much amazing work with breathtaking results. I am already looking forward to the July firing. The anagama and noborigama were unloaded systematically; the pots were laid out on pallets according to where they were originally placed inside the kiln. Therefore, one could see the atmospheric effects on the works. One of my fellow crew members at the Tony Moore April Wood Firing Kiln Unloading. That's me in the background! Unloading the anagram and noborigama involves cleaning of the kiln shelves and bricks...That makes for lots of dust and flying particles. Therefore, gloves and masks are essential gear. Seth pictured here working on cleaning off the kiln bricks. Seth is a ceramic teacher from Brooklyn. His sculptures were amazing. It's unbelievable the amount of work that fits inside both the anagram and noborigama. 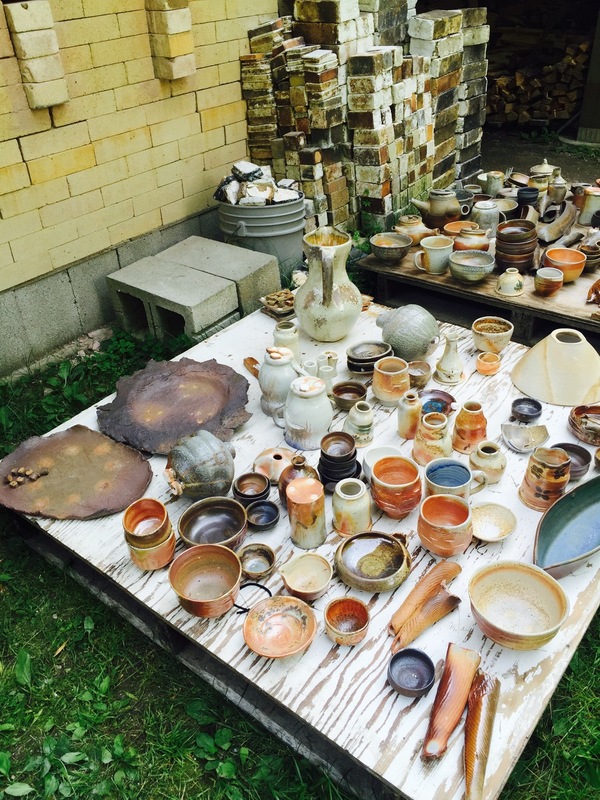 There were hundreds and hundreds of pots and sculptures unloaded from the April firing. Some of the various works that were systematically unloaded onto pallets from the noborigama. Shelita Birchett Benash with Tony Moore, sculptor and kiln master. I've learned so much in the year that I've been firing with Tony. I've met so many amazingly gifted potters and sculptors. I've been able to experience a sense of community, creativity and sharing with potters and sculptors from near and far. Catherine Thomas drives down regularly from Canada! Some of my sculptural tiles from the Tony Moore Wood Fire Kiln April unloading. These tiles were inside the anagama. the center tile seems to have gotten some fire flashing from the way Tony placed it inside the kiln. I love them! Tony Moore has a Facebook community page dedicated to showcasing beautiful works from the wood firings. It's an active and engaged community where potters and sculptors can discuss their firing experiences and results. Nature feeds the process. This is a marking technique that I have mused on for years now. I look forward to placing the several hundred small tiles throughout both chambers inside Tony Moore's anagama/noriborigama Japanese style wood burning kiln in April. Recycled materials have a way of telling me what they what want to be in their next life; my job is easier when I listen. Pushing the series to a new place. "Shelita Birchett Benash, your work was one of nine from Hudson Valley artists selected for New Directions ’15, Barrett Art Center’s 31st Annual National Juried Contemporary Art Exhibition. Juror Janet Bishop selected your work from upwards of 600 entries from across the country. In her Juror’s Statement, Bishop recognizes your work and the other selections as “works that reflect a strength of conviction—art that seem[s] to hit a high note in fresh, interesting ways no matter what the subject, style, or medium.” Congratulations!" Thank you, Juror Janet Bishop and Barrett Art Center. I am tremendously honored and elated to have my sculptural work chosen as part of the distinct group of artworks for the New Directions 2015 Contemporary Art Exhibition. ABOUT NEW DIRECTIONS and the BARRETT ART CENTER: New Directions is a premier national exhibition of contemporary art in all visual art media, showcasing the current work of established and emerging artists from across the United States working in a varied array of medium and genres. The show is visited by art appreciators and collectors from the Hudson Valley and beyond, including New York City and the suburbs of Connecticut. Now in its 29th year, and juried by professionals of repute from the country’s leading modern art museums, this exhibition brings contemporary art to an atypical venue - the warm and welcoming galleries of Barrett Art Center’s 1830's Greek Revival Townhouse, which is listed on the National Register of Historic Sites. Surprisingly, the Barrett townhouse lends itself well to a dramatic, visually compelling presentation of contemporary and cutting-edge work. Janet Bishop currently serves as the Weisel Family Curator of Painting and Sculpture at the San Francisco Museum of Modern Art). Over the course of her tenure at SFMOMA, Janet has organized dozens of special exhibitions and presentations of the museum’s collection of 20th and 21st-century art, and published and lectured widely. She was one of the lead curators for The Steins Collect: Matisse, Picasso, and the Parisian Avant-Garde — an award-winning exhibition that premiered at SFMOMA before traveling to the Grand Palais in Paris, and The Metropolitan Museum of Art in New York. Other exhibitions of special note include 75 Years of Looking Forward: The Anniversary Show and Robert Bechtle: A Retrospective. While SFMOMA is undergoing expansion construction, Janet is overseeing its off-site exhibition program—“SFMOMA on the Go”—which presents exhibitions in both traditional and non-traditional venues throughout the Bay Area and beyond. Janet is currently at work on two special exhibitions slated for SFMOMA’s newly expanded facility: Matisse/Diebenkorn, an exhibition co-organized with The Baltimore Museum of Art that will explore the influence of Henri Matisse on Richard Diebenkorn, and a retrospective of the work of David Park. Janet was born and raised in the San Francisco Bay Area. She received her B.A. in art history and psychology from Cornell University in 1985 and her M.A. in art history from Columbia University in 1988. Her first museum job was at the Herbert F. Johnson Museum at Cornell. She currently serves on the Johnson’s Advisory Council. This is where my summer went. Every missed day at the beach, lunch with dear friends and missed barbecue, is on that "Holy Cow!" It was worth it. Gratitude. This large scale mosaic was greatly inspired by the Hindu reverence for the sacred cow. The precious quality of the salvaged art glass became the tool I used for adoration. THErefore, the "HOLY COW!" wears AN HEIRLOOM CRAZY QUILT MOSAIC BLANKET. The cow is strong, yet gentle. The cow is a nurturer and giver. The cow is fiercely kind. It is my intention that when people see themselves reflected in the "Holy Cow's" mirrored surface, that they will experience the same fierce nature of kind gentle beauty within themselves. The inspiration for the Holy Cow! crazy quilt mosaic came from the lot of salvaged stained glass that I received from a retired glass artist. As I picked through the scrap glass, I discovered many beautiful bits of art glass. The sumptuous pieces of colorful and unusual glass took on textile like qualities to me. At one point in my artistic journey, I made art quilts. I also, designed and sold art wear clothing. I had even developed my own unique way of crazy quilting that I called Skitzoscrap. For years, I was an avid collector of vintage and antique textiles and lace, which I incorporated into my art wear designs. The small bits of beautiful glass began taking on that same precious nature that I found when handling vintage and antique textiles and lace. I was compelled to make a scrap quilt mosaic that would include vintage art glass, stained glass and mirror. I was excited to bring that celebratory, frugal, regenerative and dynamic nature of the crazy quilt, into my mosaic design. After all, quilts and mosaics are psychically bound art forms. There are pieces of hand-rolled glass in my crazy quilt mosaic that are over 30 years old. I used many unique and precious pieces of art glass that will never be made again. Over several months, I created an heirloom stained glass and mirror mosaic crazy quilt to adorn my Holy Cow! The Holy Cow! crazy quilt mosaic has inspired me to create a series of heirloom mosaic quilts from scrap glass. My love of quilting and textiles has come full circle in glass. Bliss. This is one of the two plates that I made for the Tony Moore June 2015 Anagama/Noriborigama Wood Firing. I created all the surface texturing of the clay surface. I wanted the surface to look as if it had been buried int he ground for centuries. My plates were placed on a back shelf in the fire box: anagama. The patina is a very dark caramelized brown. I was surprised by the results. I am looking forward to further exploring texturing the clay for use in my sculptures. I made this ceramic plate with the intention of breaking it into pieces for my "Invocation" mosaic sculpture. There is something precious about the whole of something. There's a part of me that wants to savor this plate. Still, there is that aspect of ruination in my work. I find myself reveling in the mystery of what is left behind...I will write more about this later. I missed the unloading of Tony Moore's wood kiln. However, when I arrived that Sunday, there was still lots of beautiful work for me to see from the firing. I was excited to discuss the results with Tony. In November, it will be a year that I've been working as part of a crew of potters that work the wood firings for Tony Moore's Japanese style anagama/noriborigama kiln. It's been an invaluable experience. After the June unloading, Tony was very generous with his time, as he answered questions I had regarding clay bodies. We discussed what I'm striving for aestethically. Tony was able to show me the results of silica sand on a pot from the firing. The work was beautiful. I got the silica sand! The experience of working with Tony Moore and the opportunity to talk with other potters and to see the vast array of works that demonstrate varied approaches, clay bodies, and techniques has expedited my learning curve, as I am assimilating what I'm reading in my pottery books. I am so grateful for this incredible journey.